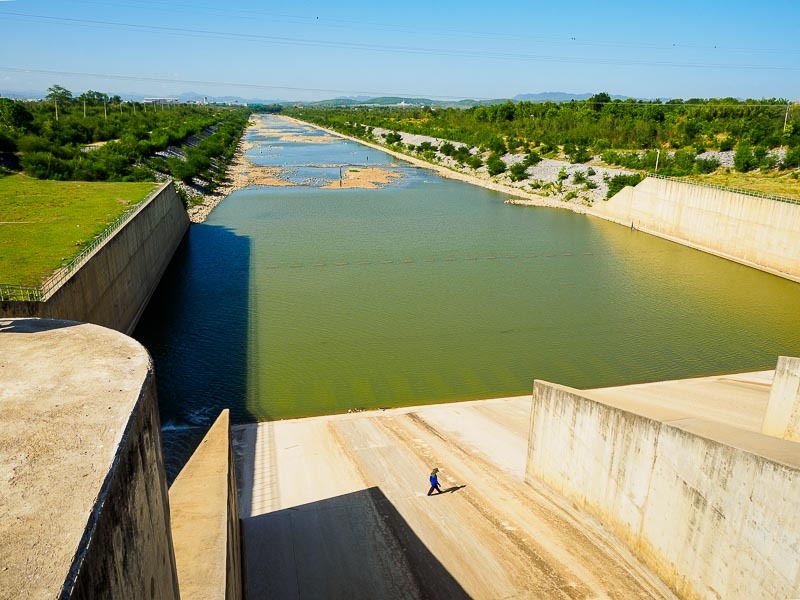 A worker walks across the spillways at Pa Sak Dam in Lopburi province. The spillway should be completely full of water at this time of year. It's the rice planting season and farmers depend on the water to irrigate their crops. This is the rice planting season in central Thailand. Rice is a big deal here. In one form or another, it's eaten at almost every meal. Thailand is the world's leading rice exporter, rice is very important not only for sustenance but also economically. Anything that disrupts rice production has serious implications for the whole country. And drought certainly disrupts rice production. We're supposed to be in the early weeks of the rainy season except it's not raining. We've had a little rain in Bangkok, but there's been almost none upcountry and Thailand's reservoirs, which provide water for rice farmers and Bangkok are running dry. The recreational area in the reservoir behind Pa Sak Dam. The land mass in the background is normally submerged. The water level is more than 10 meters below normal for this time of year. About half of the rice crop is already planted but the government is asking farmers to suspend any more planting until the rains come. Farmers in central Thailand typically get two rice crops a year harvested. The government has already told them not to plant a dry season crop because there isn't water to irrigate it. The decrees will cut many farmers income by at least half. 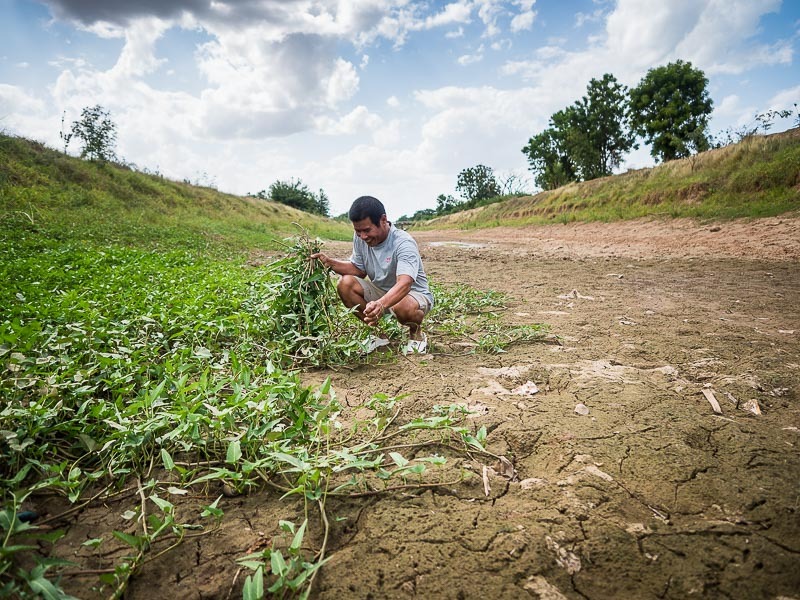 A farmer collects wild vegetables from the bottom of a khlong (canal). At this time of year, this khlong is usually full of water. This year it's dry. The farmer said he could never remember this canal being completely empty. 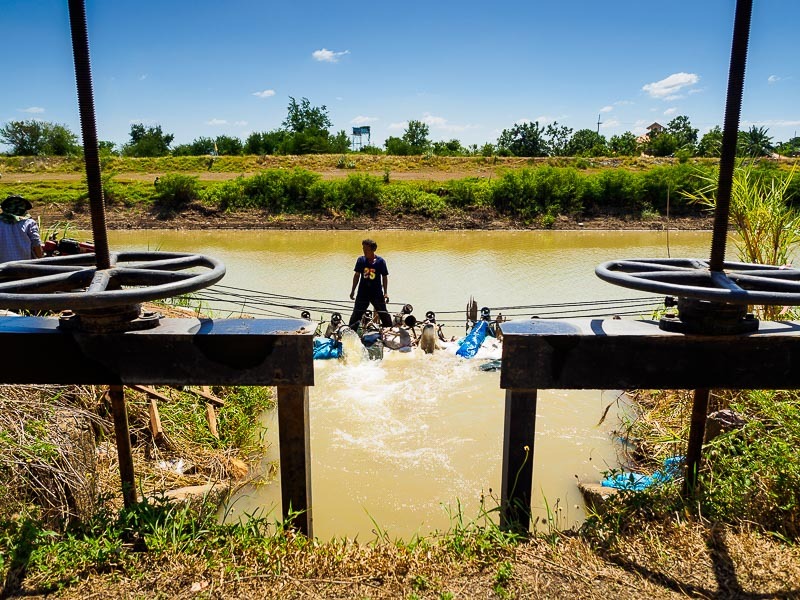 Thailand has a sophisticated and ancient water management system. One of the country's riches is its reliable water. 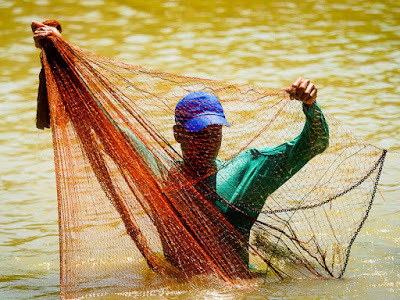 Water resource management has turned Thailand into one of the leading food exporters in the world. 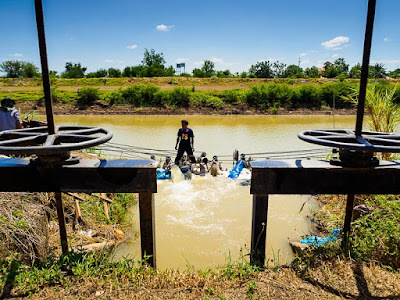 A rice farmer watches over pumps pulling water out of an irrigation canal. In a normal year, the water level in the canal is above the farmer's small irrigation canal, water flow into the farmer's land is controlled by the water gate in the foreground. The canal is 10-15 meters below normal, there is so little water is in the canal people walk across it. A farmer hauls in a fishing net. He's standing in the canal, which is normally 10-15 meters deep. The water here is only waist deep. It's not just farmers who are suffering. The Chao Phraya River, the main water source for central Thailand (and Bangkok). The riverbank north of Bangkok is collapsing in places and people's homes are sliding into the river. 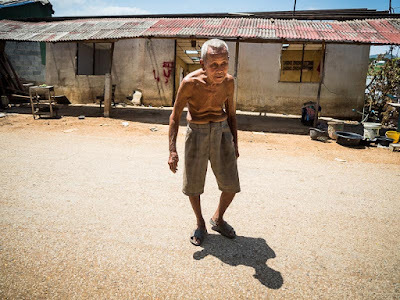 A man in Chai Nat province walks away from his home, part of which slid into the Chao Phraya River, after the river level dropped and the riverbank caved in. 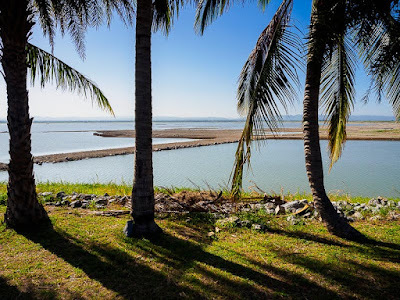 Bangkokians have been warned that their tap water could soon be contaminated by salt water because the downstream flow of the Chao Phraya isn't enough to offset the hightide's salt water intrusion. An empty irrigation canal. This is not normal and it is troubling. No one really knows how this is going to work out. If the rains start in the next couple of weeks and if the rains are above normal, the agricultural sector could recover. 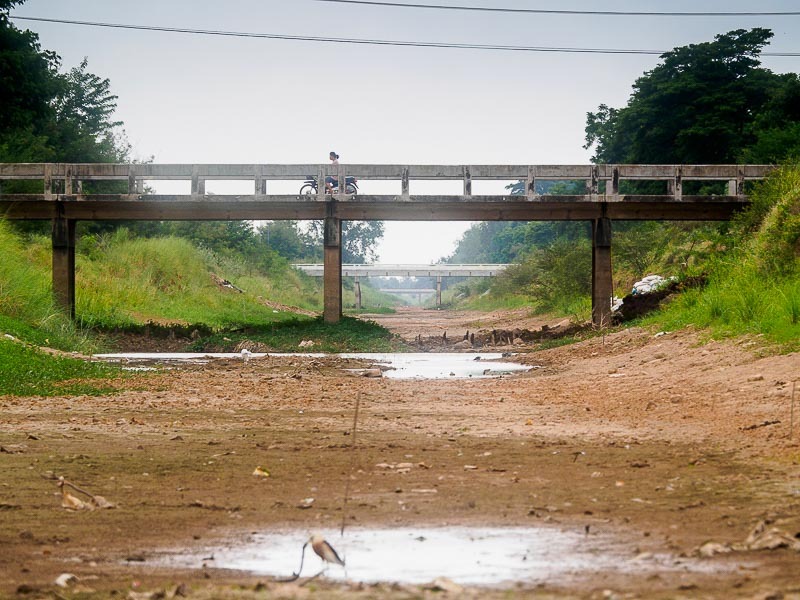 Weather experts though are predicting an El Niño, which means below normal rain for Southeast Asia, which means the drought will continue. There could be serious long term implications with a continued drought. One of the factors that lead to the "Arab Spring" was increasing food prices caused by continuing drought. It's way to early to predict that for Thailand, but Thailand's military dominated government has already warned farmers that they shouldn't launch any protests. There are more photos of this year's drought and Thai agriculture in my archive or available from ZUMA Press.